I should be posting way more but I’m enjoying the summer and it’s just plain hard to stay indoors and macrame or sit at my computer any more that my part time job dictates. 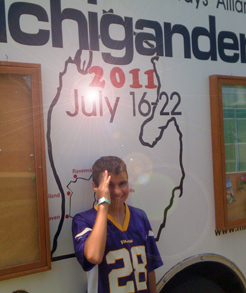 Top two pics are my grandson Robert during our 2-day Michigander Tour from Gobles to South Haven, Michigan. It was 48 miles roundtrip and it was so cool!!! Along with about 400 other bikers we traversed the beautifully shady Kal-Haven trail that led us to the shore of Lake Michigan. Now as most towns along the shoreline are hilly, it was difficult to maneuver a camera and a hill, so I have no coastline pics. 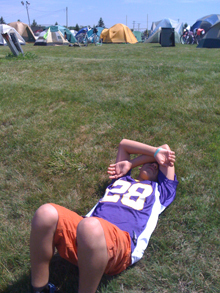 Here’s one of Rob standing in front of the support trailer, and one exhausted Rob lying down near tent city. 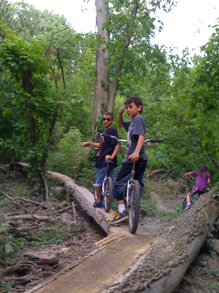 Earlier this summer we all biked through the woods that runs along the winding shoreline of the Middle Rouge River in Dearborn. 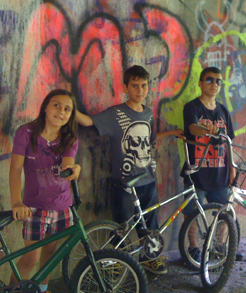 Starting at the graffitti under the Brady street bridge we tried to make it to the south shore of the Henry Ford Mansion but the bugs got the best of us. Got a big kick out of the huge hewn trees laid end to end. Whoever did this, wow and thank you. We loved it.